I'm not that big of a fan of the official Arduino IDE (in terms of visuals), so I've started looking for nicer alternatives. However, most of the projects I've found are in alpha/beta and are generally incomplete. I'm 100% new to circuit board programming and I've never used an Arduino before, but from what I gather the Arduino IDE is just a wrapper for an avr library which does the actual writing to the board. Are other "arduino-like device" IDEs a possible option? Again, I'm very new to this so user-friendly-ness would be nice. Warning, a long-winded explanation is forthcoming. I'd like to clear some misconceptions that I think you're having. The Arduino is really two things. A small bootloader firmware program which was previously programmed onto the chip from the factory. Yes, the Arduino IDE basically wraps avr-gcc - the AVR C compiler. Your projects, or "sketches", incorporate the mentioned Arduino libraries and is compiled with avr-gcc. However, none of this has anything to do with how anything gets written to the board. How these sketches are deployed is a bit different than usual. The Arduino IDE communicates with your Arduino over the usb-to-serial chip on the board and it initializes a programming mode that the bootloader understands and sends your new program to the chip where the bootloader will place it in some known location and then run it. There is no "avr library which does the actual writing" - it's just the Arduino IDE opening a serial port and talking with the bootloader - this is how your debug messages get printed to the IDE during runtime as well. Any alternative IDE will have to be able to do this same serial communication with the bootloader. Arduino is easy because of all the libraries they already provide you with and one-touch program-and-run from the IDE. I honestly don't think it gets any easier, or more user friendly. They've abstracted all the details of the AVR micro-controller and the building/deploying process. The alternative would be something like avr-studio (which also uses avr-gcc for its compiler) and an ICSP programmer (which is an additional piece of hardware that you have to buy). You aren't provided with much other than some register definition header files and some useful macros. You also aren't provided with any bootloader on your AVR chip, its just a blank slate. Anything you want to do with the microcontroller, you'll have to go in depth and learn about its hardware peripherals and registers and move bytes around in C. Want to print a debug message back to the PC? Write the UART routine for print() first and open a terminal on your computer. A step lower from this you're writing code in an text editor and calling avr-gcc and avr-dude (programming command line tool) from a Makefile or command-line. A step lower from that and you're writing assembly in a text editor and calling the avr-assembler and avr-dude. I'm not sure where I'm going with this, I just think that the existing IDE and Arduino is absolutely genius and perfect for a beginner - their claim to fame is user friendly-ness. Maybe not the answer you're looking for, learn the work flow and make something cool with it. I use SublimeText as my primary text editor, so I was very happy to find Stino, which is an Arduino plugin for SublimeText. It's a complete replacement for the Arduino IDE (though you do need to have a copy of the Arduino IDE so Stino can find the libraries). It's got a few bugs, but is quite usable. I've hardly touched the Arduino IDE since discovering Stino. The free Microsoft Visual Studio and Atmel Studio Plugin is simple to use and has all of the useful features of the Arduino IDE. Sketch code remains fully compatible with the Arduino Ide. The plugin uses the same build process and tool chain as the Arduino Ide. You choose which Arduino Ide version(s) you want to use with your projects. Provides many additional features such as drill down into compiler errors, disassembled view (with drill down), code completion, upload via programmer or Usb. Supports multiple Arduino versions in a single Ide. The Visual Studio version also supports the Intel Galileo. Atmel Studio is based on Visual Studio. Atmel Corp. are the company that make the Arduino micro-controllers. This means the Atmel Studio Ide is aware of and made for the Arduino micro-controllers. Atmel Studio also provides other tools such as a Simulator. Personally I recommend (since I wrote it ;) ) UECIDE. It was originally based on MPIDE for the chipKIT boards, which itself was based on version 0023 of the Arduino IDE, but there's not much of the original code left now, it has all been re-written. It supports all the Arduino boards, plus chipKIT boards, Launchpad, Maple, and a whole host more. 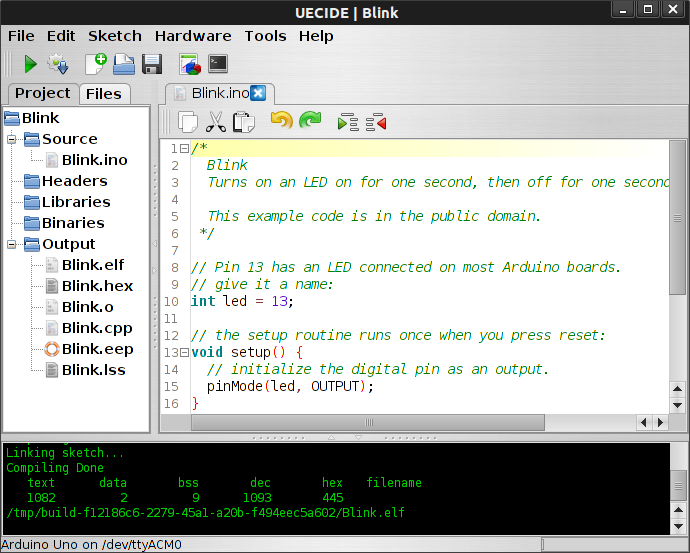 Also, you can try browser-based/online IDEs for Arduino, such as Codebender. I recently switched from the joke that is the Arduino IDE to code::blocks-arduino. It is better suited for more complex projects with multiple sourcefiles. You have complete control over compiler flags, build target and many other things that are either missing or badly-written in the official IDE It is very similar in operation to the eclipse plugin, but not as bloated as eclipse code::blocks-arduino a stand-alone build. It comes with several useful tools for uploading and debugging, such as a SUPER COOL AND USEFUL serial monitor with some really nice features like direct i2c (twi, whatever you want to call it) debugging, serial capture and csv output, etc. A "middle" approach would be MariaMole, which unfortunately is windows-only, but has a lot of the simplicity of the official IDE, but with a lot of the features of a "classic" IDE. a notable difference between the two is MariaMole uses .cpp and .h files while code::blocks-arduino uses .ino like the official IDE. Jon L:s anser sums up the Arduino quite well and since he just touches on the alternatives I could clarify them a little bit more. The gnu toolchain (on either Linux or Windows) that is using WinAVR and a AVR JTAGICE mkII. But please note that just as Jon L states, alt1 is basic and easy since it removes most stuff from your face. Turn on a LED, call the turnOnLED function in the lib. 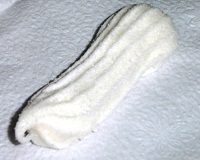 Alt2. You get some help about the chip and a more classic IDE, but you have to do most of the things your self. Alt3. You have to do everything your self but you get maximum power over your environment. So now you can select what kind of development you would like to do, one good thing with the AVR stuff is that the tools like the jtag is quite affordable so it is a quite cheap platform to work with regardless of what level you use. And since it is a AVR on the Arduino, if they have a jtag connector you can use alt1,2 and 3 on the Arduino boards. You can use emacs (or similar) for writing code, and make for building and deploying it. The arduino packages ships with makefile samples and stubs for doing all the things. Eclipse is a great alternative and now with the eclipse plugin you can find at eclipse.baeyens.it it installs in less that 15 minutes on windows mac and linux. It even has a serial monitor. The standard all-in-one Arduino IDE comes with an insanely basic editor, something you'll quickly outgrow. I recommend replacing the editor first, continue to reply on step 2 and 3 from the basic package. Once you're ready to venture beyond, see http://playground.arduino.cc/Main/DevelopmentTools for tools that can take on all three major functions. What Dan said (in a comment to the question): Eclipse is a full featured IDE that works very well with Arduino. (Seconding his setup comment, too, though). But the easiest way to set it up might be to port someone else's working installation to your own machine to get a working config, and start tweaking from there. I have been using this Makefile. It takes care of most of the process for you. Then you just write a simple local makefile to provide board specific details. There's really great documentation for how to use it. Then I just use my preferred text editor to write code in C or C++, compile it with my simple local makefile. Uploading is also dealt with by the makefile I linked: just call "make upload". This is a nice solution because you can then use whichever text editor you want. It allows you to easily link all the arduino libraries, plus any local libraries that you have. This is an old Ide that I've found very fast and flexible. It can program Arduinos, and also Arduino clones like Paperduino or tinyUSB. You can also check the USB or serialports, test fuses and lots of other stuff in an easy way. Not the answer you're looking for? Browse other questions tagged arduino avr ide or ask your own question. How does the Arduino IDE/build system work? Is there a Scratch-like Arduino IDE? Am I able to burn a bootloader and program with an AVR ISP? Programming for the Arduino without the Arduino IDE.. but with the provided libraries? Arduino: Delay of 1ms necessary between Serial.read and Serial.write?